The City of Saskatoon is installing devices at some rail crossings to notify first responders when a train blocks the way. 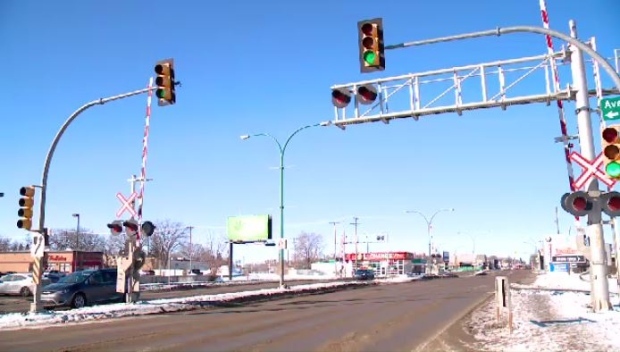 The City of Saskatoon is installing a device on railway crossings that will inform first responders when a train is blocking traffic. “The underlying goal is how we can we let first responders know as quick as we can,” acting director of transportation Jay Magus said. Cell modems will be installed inside traffic control systems on four railway crossings: 22nd Street and Avenue F, Idywyld Drive and 25th Street, Warman Road and 33rd Street, and 33rd Street and Edmonton Avenue. When rail arms go down and a train is passing through the cell modem will inform the city, which will inform the Saskatoon Fire Department and Saskatoon Police Services, Magus said. Police Supt. Randy Huisman said having a device that will “proactively” tell them when a train is coming will benefit officers when dispatching units to a scene. The city is also installing signs near the 11th Street and Dundonald Avenue railway crossing that will inform drivers when a train is passing through. “It’ll tell the driver the crossing is blocked, so you should maybe take a different route,” Magus said. The pilot project is funded by the federal government. If it’s successful, the city will implement the device on more railway crossings, Magus said.